Is Drought on Our Horizon? In Sonoma County we have not had to endure the types of extreme weather folks have suffered through in the Midwest and East coast, but we just experienced the driest year anyone around the North Bay can remember. What 2014 will bring is still anyone’s guess but with only two inches of rain since the official “rainy” season began in October 2013 we will need a generous January, fabulous February, and possibly even a miracle March to make us all breathe easier. Simply looking at our typically beautiful hillsides is a reminder of what it means to have inadequate rainfall. Best Gardenworks’ Look for 2014 (uses two-thirds LESS water than a lawn of the same size). “We’re looking at it as a dry year next year (2014) — another dry year — and we’re taking it very seriously,” said David Guhin, director of utilities for the city of Santa Rosa, the largest customer of water at the Sonoma County Water Agency. Water between midnight and 6:00 a.m. to reduce water loss from evaporation and wind. Water your lawn and garden in 2 or 3 short cycles rather than one long one. Watering to a depth of 4″ to 6” will encourage deeper healthier roots and allow the plants to go without water for longer periods of time. Target your water use in your garden by hand watering exactly in the spots that need it. Inspect and tune-up your sprinkler system monthly. Adjust your sprinkler heads to prevent water draining off your lawn and down the gutter. Reduce sprinkler run-time, and don’t be a gutter flooder. Use a broom, not a hose, to clean your driveway, deck, or patio. Washing a sidewalk or driveway with a hose uses about 50 gallons of water every 5 minutes. Your water meter is an important conservation tool. It not only measures the amount of water you use, but can also tell you if there is a leak in your plumbing. Use a bucket and a hose with an automatic shut-off nozzle when you wash the car, or take your car to a carwash that recycles. Save water by extending the time between car washes or don’t wash your car at all. Cover pools and hot tubs to reduce evaporation. We couldn’t agree more. 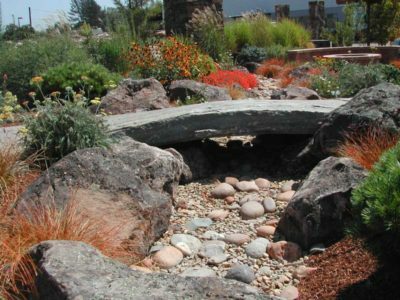 Gardenworks makes water management, water efficiency, and water conservation our responsibility and a matter of course as we serve our clients, every season of the year. It is a primary consideration in everything we do, from the selection of plants to the design of irrigation systems and the equipment choices we make. If you would like the Gardenworks team to help you with anything having to do with low water use landscaping and water conservation contact us today!